Please complete a Request Reservation Form. We make every possible attempt to respond to your request by the end of the day. At the very latest we will respond to you within a 24 period. If you have specific questions then please indicate those questions on your Request Form. 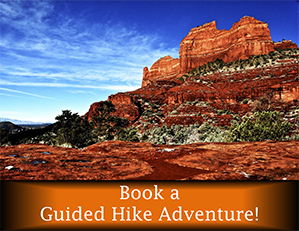 Our guides are the most experienced and knowledgeable guides in all of Sedona. We live and breathe the trails 365 days a year. If we are not taking out guided trips then we are teaching or helping guests in our store with trail recommendations, gear training, mapping 101 and general knowledge of the area. 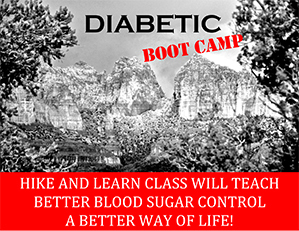 All guides are CPR/First Aid certified and trained in proper emergency protocols. Our private outings are tailored based on your abilities and desires. Trails can be as simple as a “walk in the park,” or as difficult as “marathon like adventure” covering 5000 feet of elevation and 10 miles. The majority of our hikes are moderate trails that provide gradual elevation change surrounded by Red Rock Beauty. What type of gear/apparel will I need? Proper footwear is the most important aspect of safety on the trail. Make sure your shoes/boots have adequate “lugs” (rubber cleat-like protrusions on the sole of the shoe). Our guides will be providing trekking poles to each hiker to insure additional confidence and stability on the trail. For your comfort, we recommend pants for temperatures 20-55 degrees and shorts as we get into 60 degrees and higher. It is important to dress in layers. It is not unusual to have a 40-degree temperature change during the day. High elevation sunlight can be intense. Sunscreen and hats are highly recommended. If you tend to burn then a lightweight long sleeve shirt is also recommended. The Hike House is a comprehensive retail store that provides over 35 styles of hiking boots/shoes, apparel, socks, hats, trekking poles, backpacks, guide books, maps and more. We found that our guests enjoy meeting people from all over the world. We have also found that some people do not necessarily want to hike alone. This scenic hikes allows for 6 people (maximum) and a guide to take in the majestic red rocks while learning about the area/geography/culture as you would on a private outing. Note: The group hike requires a minimum of 3 people. If the 3 person minimum is not met 24 hours prior to the outing then you will be given the option of a private outing. Private outing cost will be applicable. By far our most frequently asked question. In hiking these trails over the past 17 years (I hike a lot) I have encounter a total of 3 snakes on the trail. With our elevation and cooler temperatures we simply do not have the number of snakes you would expect for the area. Additionally, you really do not see them on the trail. As local snake expert, Russell Dunn, would tell you “food sources for snakes on the trail are not plentiful…if you want to find them then you need to go by the houses…. Human food = small animals (mice) = some snakes”. June-August provides the best opportunity to see snakes but even at that it is doubtful you will encounter any snakes. When should we book our adventure? 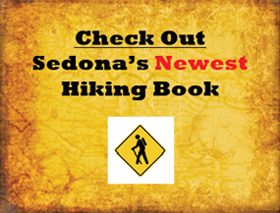 The Hike House is the #1 hiking resource in Sedona. We assist more hikers with trails and gear than all other establishments combined. Our outings book up very quickly. It recommended to book your guided adventure 30-45 days prior to your arrival. Where should we meet to begin our hike? All guided hikes begin at The Hike House. Please meet at the store 30 minutes prior to the outing. If you are in Sedona without a vehicle then please let us know and we will be happy to pick you up at your hotel.